Take active steps to reduce infection risk and improve patient care. helping to avoid possible contamination. See full details on our titanium I/A Handpieces and Tips. 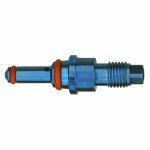 Product: 92-IA100 I/A Adapter with Female Thread. Titanium. Screw-in. Note: Accepts single-use and multi-use Alcon* Micro-Coxial tips. Download 159 Tips to Prevent TASS, a report by Outpatient Surgery Magazine, by clicking here!